Existence is infinite, not to be defined. And though it seem but a bit of wood in your hand, to carve as you please, it is not to be lightly played with and laid down. When rulers adhered to the way of life, they were upheld by natural loyalty. Heaven and earth were joined and made fertile, life was a freshness of rain—subject to none, free to all. But men of culture came, with their grades and their distinctions; and as soon as such differences had been devised no one knew where to end them. Though the one who does know the end of all such differences is the sound man. Existence might be likened to the course of many rivers reaching the one sea. Once Zhuang Zhou dreamed he was a butterfly, a butterfly flitting and fluttering around, happy with himself and doing as he pleased. He didn’t know he was Zhuang Zhou. Suddenly he woke up, and there he was, solid and unmistakeable Zhuang Zhou. But he didn’t know if he were Zhuang Zhou who had dreamed he was a butterfly or a butterfly dreaming he was Zhuang Zhou. Between Zhuang Zhou and a butterfly, there must be some distinction! This is called the Transformation of Things. This symbol is used to express the eternal Dao which translates as the Path or Way of Life. The way of nature is the balance of coexisting opposites which ebb and flow in strength. To favor one over the other produces attachment, constant tension, and dissatisfaction. The purpose of Dao is to walk the middle path unattached to the opposites. 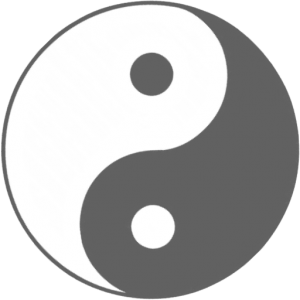 The symbol of Dao, the Taijitu, captures the essence of the Dao. The symbol is divided equally into the opposites—black and white. The teardrop shape symbolizes the increase and decrease of the power of the opposites. The dot represents the seed of the return of the opposite. The intersecting line between the two elements represents the path one must follow to find balance between the opposing forces. It is not straight but curved by the natural give and take required to maintain balance. bore one, then two, then three elements of things. heaven, earth and man—to balance happenings. because in true succeeding high and low correlate.